Creating China’s Special Forces Assassin in action movies! Grand Master Dodaro has created a combat tactical energy conditioning system for Stunt Fighters to explode amazing speed, endurance, and force never seen. International Authentic Credentials from China’s Military Commander, Professor of Chinese Wushu, Commander of Japan’s Imperial Army, Zen Priest, and Shaolin Warrior Monk certified Grand Master Joseph Dodaro after 53 years of dedicated training. China’s traditional secretive systems and combat tactical assault energy conditioning maneuvers are strategically, scientifically, and ingeniously evolved from 7,000 of research developed by Military Generals. combat version of these drills with powerful natural exploding force from the entire body in an eight directional Baguazhang pattern. Exploding pressurized force in close quarter combat makes it impossible to use techniques, weak attacks as punches, or kicks that would easily fracture even in practice. Combat drills destroy any defensive force quickly executing deadly pressurized force. Commander Hsu designated traditional secretive Chinese systems and assassination combat tactical assault maneuvers that were strategically, scientifically, and ingeniously structured for each assassin’s intellectual skills to train solitary. Military QI Gong, Chen Taijiquan, Tongbeiquan, Xingyiquan, and Shaolin traditional secretive military systems created over 2000 years ago and assassination combat tactical assault maneuvers for each one of the systems were designated by Commander Hsu and Professor Zhang. Over 40 years to master, Joseph Dodaro who accomplished this extraordinary achievement at an outstanding level was appreciated by Professor Zhang who advanced him in three levels of Grand Master in the oldest, highest, original systems in the world of QI Gong 7,000 years old, Taijiquan, and Shaolin 2,000 years old. Maneuvers were strategically structured routines extracted from the original traditional systems that were executed repetitions at various speeds simultaneously transformed extraordinary conditioning, enhance health mentally and physically, and intellectual combat skills. 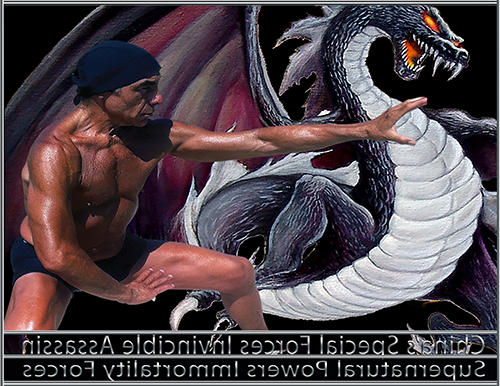 The disciple’s training reconstructed his dynamic life force energy that became more powerful each class as he has developed an incredible physique with no prescription drugs, no psychoactive substance abuse, or psychological dependencies as he is in extreme combat conditioning at age 60 in his pictures. Commander trained him to develop his mind and body in Taoist philosophy as a tree, grow slow, withstand enormous punishment, be pliable, and become extremely powerful as you age allowing you two enjoy life as the Enlightenment and longevity be in your destiny. Most martial artists grow fast like a flower, look beautiful, but die young. Combat energy conditioning Maneuvers precisely generate powerful movements to develop extraordinary muscle and bone mass to protect the outer structure. Thrusting energy channels energize pathways to explode internal Yin Yang spiraling intrinsic force simultaneously with external spiraling intrinsic Yin Yang force that executes a calm maximum force explosive surge with minimum energy. Assassins ignite the imagination to create these magnificent forces as Shen Psyche meditative QI pressurized force energy breathing engages in the transformation of the three secret treasure energies that transforms into the energy thrusting channels exploding with supernatural powers. Transformations of combat energies assassination maneuvers train the body to attack in a strategic powerful force that makes it impossible to stop or control as internal Shen Psyche QI meditative energize breading pulsates enormous amounts of superior force executing continuously during the assault. Assassins create devastating continuous force from each part of the entire body that overwhelms the enemy. Assassins advance in small Dragon cross-leg steps that allows quick assaults in an eight directional Baguazhang pattern for multiple attackers. Assassination combat tactical assault energy conditioning maneuvers and traditional Chinese military systems are strategically, scientifically, and ingeniously aligned to generate explosive force in energy advances. developed to attack at any time during training as extreme concentration is vital for the contractile muscles to respond instantly and consistently as assassins move rapidly against multiple attackers executing Dragons exploding claw. Xingyiquan is an explosive military system that mainly executes the Ferocious Tiger, Fire Dragon, King Cobra, Crane, and Eagle Claw. Animal maneuvers develop extraordinary specialized intrinsic energies feel magnificent. Military Xingyiquan Fire Dragon assassination maneuvers generates explosive spiritual enlightenment energy that powers the Dragon in a twisting serpent type maneuver demanding agility and a muscular structure that can quickly sink into a low cross-leg twisting stance exceptional for firearms and dagger attacks. Fire Dragon assassination maneuvers execute a pure energetic energy force that sparks the imagination that transcends the assassin in the meditative spiritual world erupting 20 thrusting channels to consistently revitalize the internal organs through Meridian energy channels. This specialized intrinsic superior energy source equivalent to Military Chen Taijiquan that executes energies consistently for three hours. Military QI Gong, Chen Taijiquan, and Fire Dragon are executed late evenings and early mornings followed by Xingyiquan and Tongbeiquan. Traditional Military secretive systems are separated making it impossible to discover the correct transformations for ultimate energy force to create the invincible assassin was supernatural immortality powers. Xingyiquan Five Elements chopping-metal / drilling-water / crushing-wood / exploding-fire / crossing- Earth. Twelve animals Dragon, Tiger, Snake, Crane, Eagle, Bear, Monkey, Chicken, Horse, Swallow, Goshawk, and Crocodile. This conditions meridian channel pathways that strengthen the fascia that overs all 78 organs to function at peak performance and withstand enormous amounts of shock. Military Xingyiquan created by China’s Generals strategically and scientifically aligned maneuvers to develop the muscular and skeleton system to astronomical levels generated energetic energies that pulsated oxygen enriched blood in large volumes opening arteries and veins allowing tremendous amount of pressurized exploding force to continually destroy as it is replenished immediately. These pathways develop longevity preventing disease as high blood pressure. Tiger static low pressurized force stances place enormous amounts of pressure on the bones through the process of ossification injects more calcium into the bones that flat bones produces richer red and white blood cells and minerals that are vital for the organs. The enormous amount of energy circulation prevents disease. Military Xingyiquan maneuvers condition the assassin to execute a continuous powerful energy serge of pressurized exploding force simultaneously from the entire body in a forward tactical assault. Maneuvers strategically force Shen Psyche to develop the body by executing internal energy forces to generate extreme external conditioning. Xingyiquan ferocious tiger conditions the slow and fast twitch contractile muscles for an explosive entrance. Tongbeiquan executes an extraordinary powerful Chen energy exploding crushing force in a small circular pattern with extreme speed designed to destroy multiple attackers quickly with minimal force. Military Xingyiquan and Tongbeiquan traditional secretive military systems training for two hours then executes assassination tactical assault maneuvers executed at various speeds conditions the assassin to move quickly executing pressurized exploding force at any intervals with maximum power and lightning speed. These transformations of traditional military systems and exploding assassination maneuvers evolved to create the 21 special forces assassins that Commander Hsu led into the mountains to destroy enemy camps. Commander Hsu experimented with his disciple over 20 years as this was the first time he secretly trained an individual in of privately as he can witness immediate results. Tongbeiquan traditional and assassination maneuvers were the disciples chosen systems by the Commander that the disciple demonstrated at all Chinese events. Stunt Fighters / Download Cobra PDF File for Complete Comprehensive Methodology of Systems.